A good waiter serves when you need him, but stays in the background at all other times. 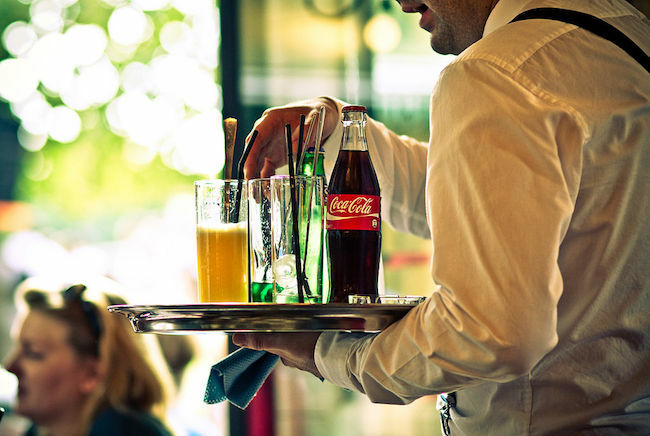 A good waiter has a clearly defined task that he fulfills in a seemingly effortless way – no matter who is the guest. A good waiter serves all guests and their wishes equally good, no matter how diverse they are. Good (Internet)products are just like waiters. They are around when you need them. But other than that, they don’t obtrude themselves onto the user. They have a clearly defined purpose, which they fulfill equally well for every user that comes along. They don’t try to change the user, they don’t educate. They are simply there, stay in the back and wait until they may serve. Thinking of amazon, we don’t even think of the interface, but the service behind it. The mental picture we have of the interface remains pale. 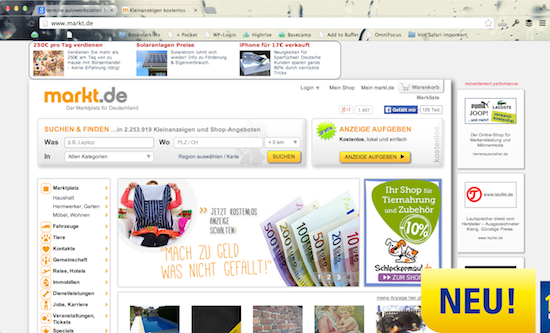 Once we think of amazon, we do know how the interface looks like but it leaves no special impression. The most positive reaction I get to hear is: “It looks better these days”. (Even the redesign a couple of years ago was done without the slightest commotion.) But it serves its purpose and it does that damn good. 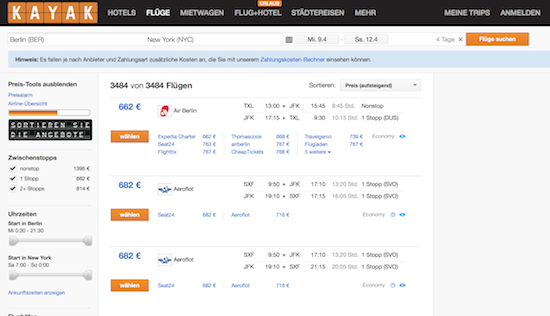 If you look at kayak, what you can do is simply find flights (in the meantime hotels, rental cars etc. were added). Nothing else. Even facebook (and I really don’t like it) is clear: News from your ‘friends’ are in the undisputed center. And this center remains clear. (Now, Paper will try to make that even more clear, while I personally doubt that people will see Paper in the same social context as the traditional facebook – lets wait and see how that fits). If you look at successful internet products, a pattern becomes apparent: They don’t attract any attention and stay in the back. They do not transport string messages, they don’t need to justify, or explain. 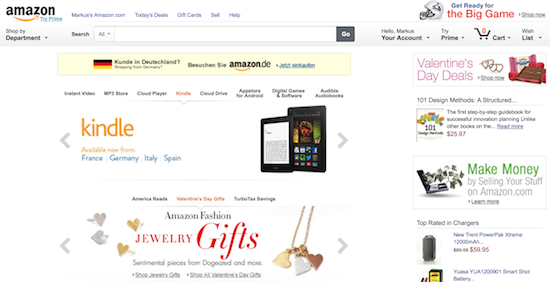 Amazon could plaster its homepage with messages on customer obsession like crazy. They don’t. They could try to make you a kindle author with lots of their real estate. They don’t. It is interesting what they do not. Good products have one specific purpose they serve and they do so with minimal to no variation. And this purpose you get immediately. The recipe has become perfect. In context with what lots of us do for a living that seems counter intuitive: All the work that goes into Personas, empathy maps or customer journeys. The energy that goes into extracting the real deep needs of the most different people while shadowing them, visiting and interviewing them, understanding their taste, what colors will fit and why. To find the right scenario in the right situation, coming up with the right information architecture, some say. Are the customers in an early stage of decision or late? What content fits that stage? If we have the right content, might cohorts of group A change into behaving like those of group B? Because we know: B will buy. Google vs. Yahoo – who wins? All that makes sense. The detailed research of endless user journeys, empathy maps and what not. But the ultimate, counter intuitive goal of all that is not details, but simplicity and ease for as big a market and group of people as possible. Finding the minimal set and product, leaving it open to ambiguity. In the end, all analysis is only the basis for understanding how to define the ultimate reduced offering that our targeted customers understand in a blink, without knowing. And here I am talking of the one offering. If we go to market with an offering too much, we demand too much from the customer. Amazon started with being the best bookstore, nothing else. At mobile.de up to this day, what you find is cars. amazon went on and used the book market to refine the recipe and extrapolate to other markets. They made a few customers very happy from beginning, not every customer a little happy. Only then they went on until they could serve lots of markets in the exact same way. And everybody still knows what amazon does. And the interface remained the same. It did not gain complexity, it remained simple, got more refined and works and works everywhere. As long as we need to discuss how to serve the most different requests under the same interface and we don’t have a clear answer, we still fail. It is the sign to step back again, to still better understand our context and reduce our offering – until it is so simple that one short glance is enough to understand. If we need too many tabs to explain or diversity of options, we failed. And we need to go back and research and understand and study and reduce until the tab is gone. It is not the interface that is the problem but our complex offering. Another unmistakable sign for too much complexity is if design goes through too much trouble to make apparent hat we’re all about. A product that does not work ‘without design’ won’t work with design. To put hope on design is just a distraction. If design must win, we are in the area of fashion – and will be gone soon. And fashion is elusive and perishable. The product will be a gimmick. A product is under suspicion, if it wants to educate us, offers too much content to be understood, which are complex and offer too many options and need a pushy design to speak to us and to save their purpose from nothingness. And the suspicion is that the work and research was too superficial and hasty. The product may exist to serve the ego or will of a founder, designer or investor, but not that of the customer. It was simply not designed with empathy for the customer. The wish of the internal stakeholders in the focus and empathy was exchanged for vanity and stubbornness. A good waiter stays in the back – a good product too. The waiter serves the guest; we need to do the same. Our vanity needs to step back. To get there, it needs systematic work to understand the problem of the client. As long as your interface needs to speak, you’re no there yet.